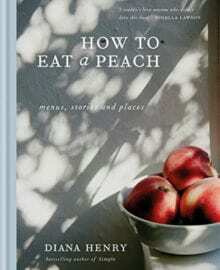 How to Eat a Peach? Sliced in a glass of moscato, and then slowly savored bite by bite, before sipping the chilled moscato on a hot summer evening. Delightful. This delight is demonstrated on every page with 24 menus and over 100 recipes accompanied by stories that inspire. Her joy of cooking and feeding friends and family make Diana Henry’s book a must have. For a stunning dinner dish that will delight friends and family, a Slow-Roasted Pork Shoulder with Stuffed Squash is weekend perfection. NO PURCHASE NECESSARY TO ENTER OR WIN. Void where prohibited by law. Open to legal residents of the 50 U.S., D.C. and Canada (excluding Quebec) who are at least eighteen years old at the time of entry and have internet access. Begins on 10.23.18 at 12:00:00 a.m. ET and ends on 11.13.18 at 11:59:59 p.m. ET. To enter this giveaway, submit your full name and email address on this form. Odds of winning this giveaway depend on the total number of eligible entries received. Only one (1) entry per email address per day. Sponsored by Leite’s Culinaria, Inc. For more information, visit our Official Rules. For a list of winners, check out our Very Happy Winners page. Be sure to add giveaways@leitesculinaria.com to ensure notification if you are the winner.